Mumbai : Peter England, India’s leading menswear brand from Aditya Birla Fashion and Retail Limited, celebrates the festive season with its new TVC campaign featuring Chennai Super Kings team along with M S Dhoni. This Diwali, the brand offers a rich assortment of shirts with vibrant colours & hues.The TVC shows MS Dhoni, Dwayne Bravo & Shane Watson of the IPL 2018 champions the Chennai Super kings, bringing Diwali in with festive cheer with Peter England’s festive shirt collection. The TVC idea was seeded to unleash the joy of gifting from the latest Festive Collection launched by Peter England. 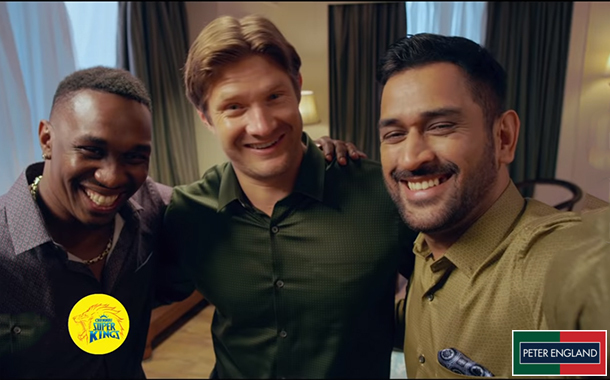 The 30 seconds film showcases a light hearted banter between Dhoni, Shane Watson and Dwayne Bravo who are seen unwinding at the team room. Dhoni who looks resplendent in his Peter England Festive Collection shirt impresses his 2 team mates who in turn shower compliments to Captain Cool. Keeping up the festive cheer Dhoni hands over special Peter England gift boxes to both Bravo and Watson. The video ends with the three cricketing maestros looking dapper and suave in their Peter England Festive Collection Shirts with Dhoni exclaiming ‘Happy Diwali!’ and Bravo and Watson laughing with him. The TVC will take a multimedia approach and will be promoted across various platforms.